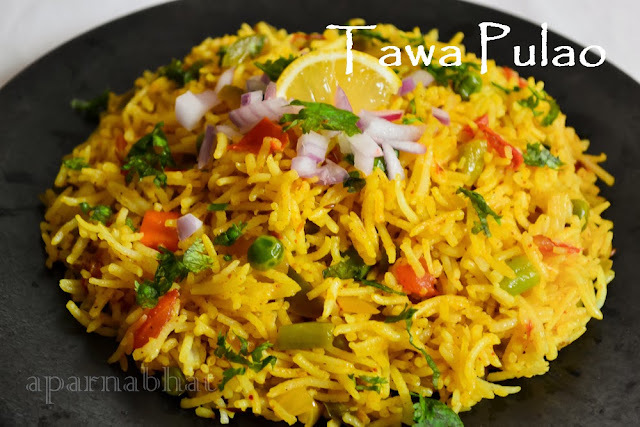 Tawa Pulao is another famous stall food [besides Masala pav] from the streets of Mumbai found especially on the carts selling pav bhajis. This is because the exotic pulao shares the same tawa/iron griddle in which the pav bhaji masala is prepared. I came across many recipes on different blogs, chef websites. Most of them had a basic recipe with variations and different proportions been used for the ingredients. 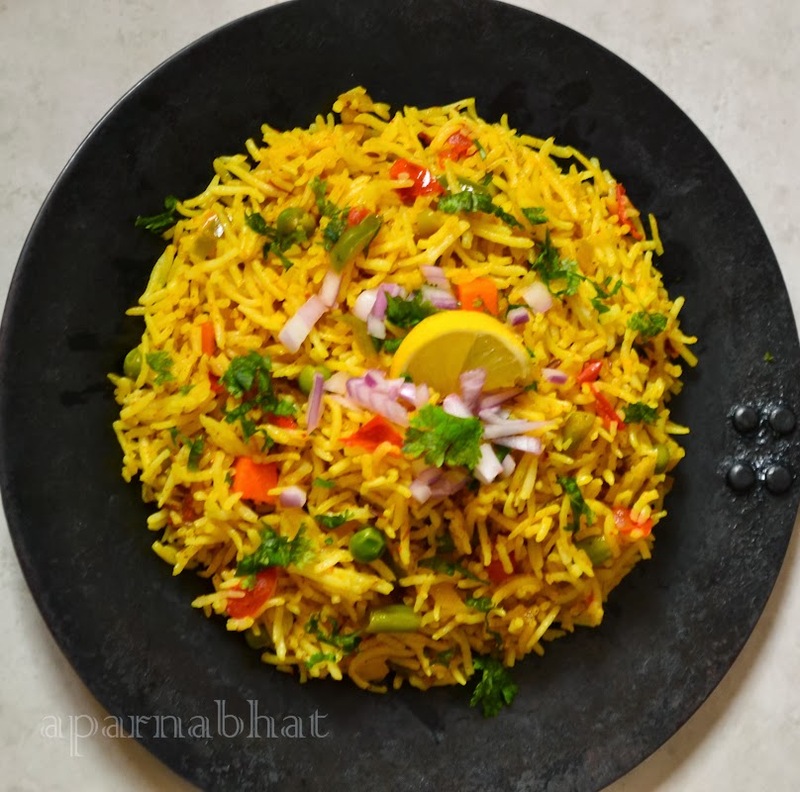 The reason could be that street food recipes are not written down and hence the vendors must have come up with their own innovations and variations to attract the customers. 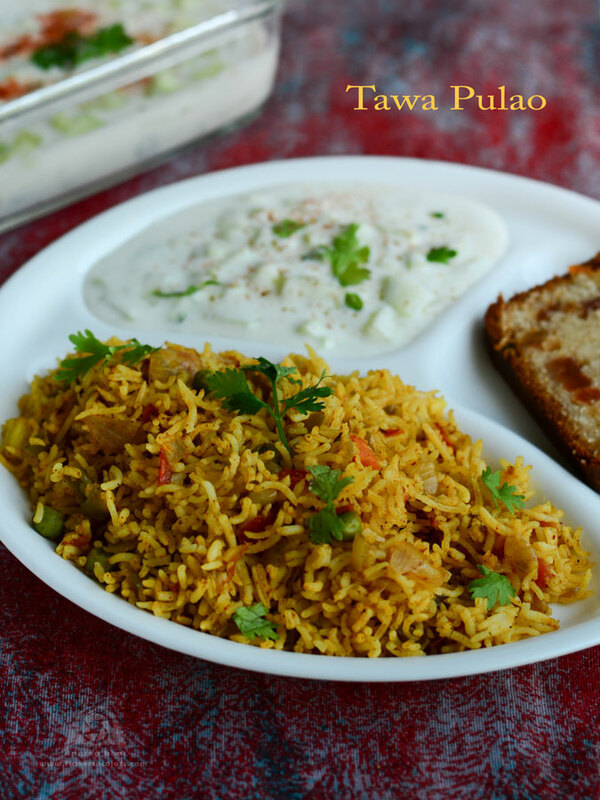 Finally, I decided to try out my version and adapted the Tarla Dalal recipe to cater the taste buds of my family. Sugar as per the taste. Cook the rice separately and keep it ready. In a wok, heat butter + oil. Add cumin seeds and when they crackle add ginger garlic paste, finely chopped onions. Saute on medium heat till the raw smell disappears. Add chopped tomatoes and saute them till they turn mushy. Next add finely chopped capsicum and saute it for a minute. Add turmeric powder, chilli powder, garam masala, pav bhaji masala powder saute for few minutes. Add boiled veggies and mix well till the veggies get nicely combined with spice mix. Sprinkle some water if the mixture starts sticking at the base of the wok. Add cooked rice, chopped coriander leaves, lemon juice, salt as per taste and sugar [optional step I usually do for my kids]. Mix everything well and cook it with covered lid on sim flame for 5 minutes. Switch of the flame. Garnish with finely chopped coriander leaves, raw chopped onions [optional] and lemon wedges. Serve it hot with raita as seen in below pic.